For all colours of genuine or imitation leather, suede, nubuck and fabric. Do not use on patent reptile, metallic leather or vinyl. 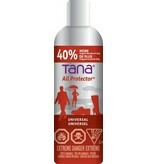 Repels the elements and resists stains. An advanced fluoropolymer based formula that creates an invisible shield that lets material breathe as it repels the elements and prevents dirt from setting for easier cleaning.